We are an electronic component separation facility. We serve the following communities in south central Colorado: Monte Vista, Del Norte, South Fork, Creede, Blanca, Fort Garland, San Luis, Center, Saguache, La Jara, Antonito, Moffat, Crestone, and everywhere in between! Please call our office in Alamosa, Colorado for more information: 719-589-8940 or if you want to drop off your recycling, please come by our offices at: 21 Craft Drive, Alamosa, CO 81101. Click here for directions to our location. 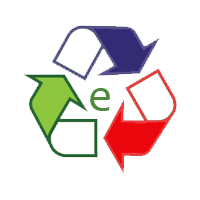 How does the eRecycling program operate? We are a "spoke" electronic component separation facility. Developmentally disabled adults from Blue Peaks Developmental Services in Alamosa are trained to break down and separate all the recyclable material inside electronic equipment. As the separated components accumulate, our "hub" site in Colorado Springs collects what has been sorted here in the San Luis Valley and combines it with other material collected from the other spoke sites and sends it downstream to eSteward, B.A.N. certified electronic recycling facilities. No material is sent overseas, jobs are created in the San Luis Valley, and all of us have a place to clean out our piles of electronic stuff. Lately we've been getting a number of calls from people who want to recycle their old TV, and don't know where to take it. We say, bring it on over. We will help you recycle your old television at our Alamosa electronic separation facility. Stay tuned for more news about where to recycle unwanted TV's, CRTs, appliances, and computers in Alamosa Colorado. What sort of electronic equipment do we accept?